Have you ever watched the stars in the countryside of Hong Kong? Although we are living in one of the busiest cities in the world, the universe is hiding mysteriously beyond the night sky and is waiting for us to explore. We would like to offer some basic tips for people who are interested in embarking on a wonderful journey through the starry sky. In this issue, we will introduce some important tools for stargazing. A star chart contains information including the name, position and pattern of all constellations that are visible at a specific time and location. A rotating star chart can simulate the motion of the sky and show the night sky at any time in a specific location. 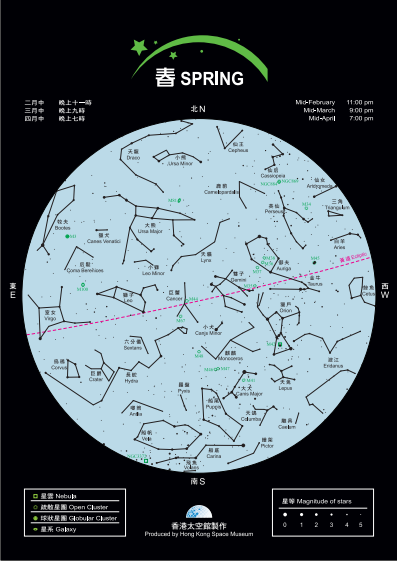 Star chart can be downloaded from the website of the Hong Kong Space Museum. 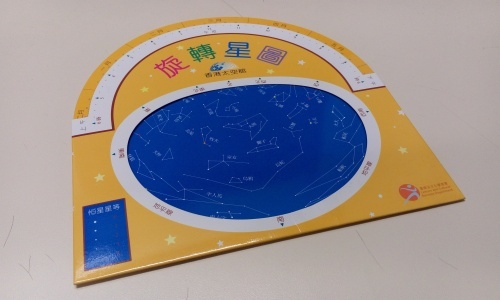 Star chart produced by the Hong Kong Space Museum. A compact and handy rotating star chart. In a dark environment, a torch should be prepared for safety purpose. During stargazing, however, we should keep the environment as dark as possible. Our pupils get wider in the dark so we can see the surroundings and watch the stars more clearly. 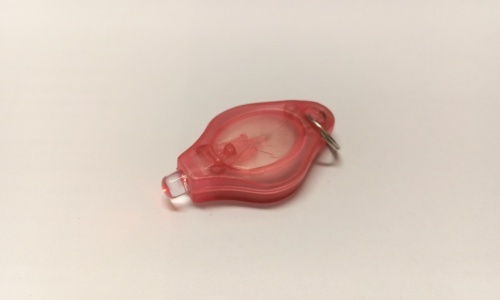 Any flash light, no matter how short the duration, would affect the adaptability of our eyes and may cause serious damage to them. 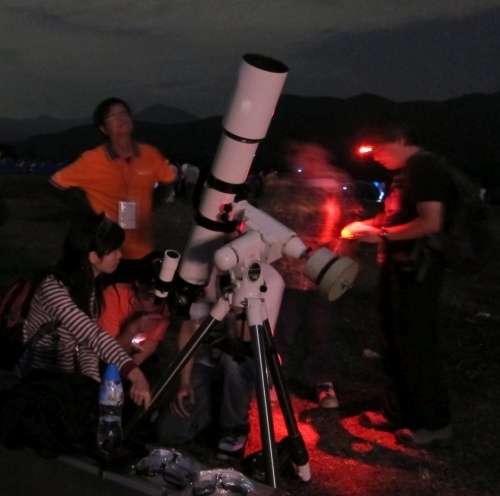 When lighting is required during stargazing, for example, in reading the star chart, please use red light torch as our eyes are less sensitive to red light. Using a red light head torch is very convenient. Small tools that emit red light are helpful during stargazing. Our eyes can see thousands of stars under perfect conditions without using a pair of binoculars. However, binoculars can reveal extremely small features in the starry sky and allow us to observe the Moon and planets with great clarity. 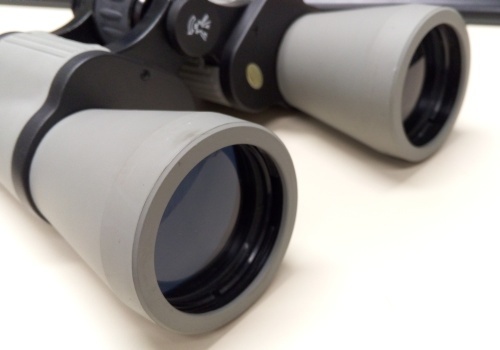 When choosing binoculars, we should pay attention to the aperture, magnification and coating on the lenses. Although large aperture binoculars allow more stars to be seen, the aperture and magnification of different binoculars do not vary too much for beginners. Coating helps to reduce the amount of light reflected by the lenses. For stargazing purposes, we would prefer more light to penetrate the lenses. During inspection, you may simply look at the front lenses of the binoculars. You should not see your own reflection on the ones with good lenses coating. 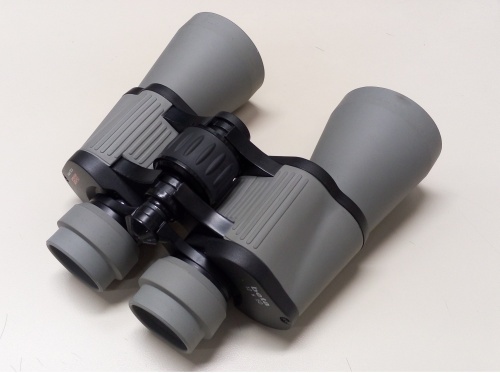 A pair of “12x50” binoculars means it has a 12x magnification and a 50 mm aperture. Suitable coating produces a purple-blue appearance on the front lenses.